George and Eleanor Butler donated the majority of the land for Glen Providence Park in 1935 as a Bird Sanctuary and Arboretum. The park was carefully planned under the leadership of Samuel L. Smedley, and its were trails laid to have minimum impact on the natural environment, while allowing visitors to experience and enjoy the plants and wildlife. Most of the early work on the park, including the man-made pond, was done in the late 1930’s by the WPA, or Works Progress Administration – its goal was to create jobs for the large number of unemployed. Due to the elegance of its plan and its original structures, in 2002 Glen Providence Park was determined by the Pennsylvania Historical and Museum Commission to be eligible for the National Register of Historic Places! This park has hosted an amazing array of events and activities in its 80 years, from decades of summer concerts starting in 1937, July 4 Fireworks & Festivities from 1952 to 1986, and Fishing Rodeos for kids, to the park’s longest running event: the still-running Great Media Egg Hunt started in 1954! Glen Providence Park has inspired numerous volunteers, including Boy Scouts and Girl Scouts, to help maintain its natural beauty. Records from before the park was established show that the land was called Scroggie Valley– including a 1700’s Ghost Story, an 1800’s Witch Story, and an 1848 Shingle Mill along the creek. There are even early 1900’s microscope slides of specimens collected from “Scroggie Run” at the Academy of Natural Sciences, and there is an ornate 1897 inscription on a hundreds-year old American Beech tree! 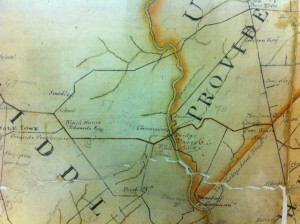 Historical maps dating back to 1681 illustrate the development of the land since European settlers arrived, and we researched the Okehocking, the Native Americans who lived in the area before the settlers. One of our most intriguing discoveries was that park founder Eleanor Reed Butler also brought the sport of golf to Delaware County, in 1896! We are working to revive the park’s history- on our first volunteer day, we restored the 1937 WPA concert stage, and in September 2012 we revived the decades-old tradition of summer concerts in the park! 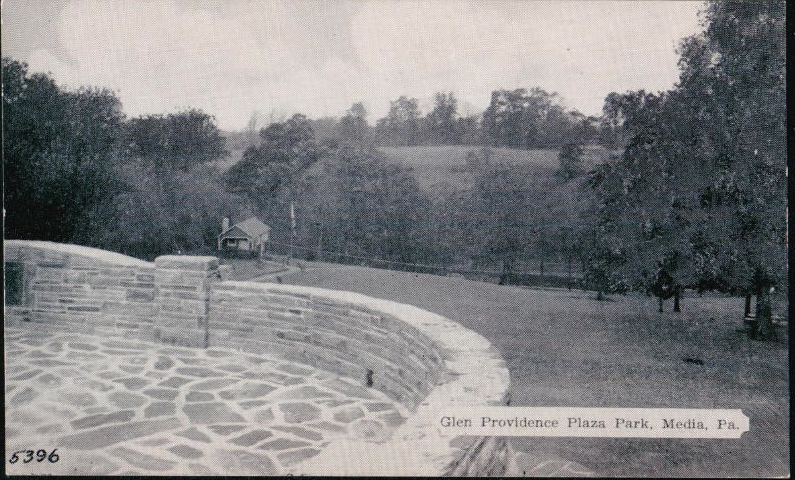 You can see the 1941 Nature Guide to Glen Providence Park that we uncovered in the Media Historic Archives. We hope that the lovely, but now-dry, Eleanor Reed Butler waterfall by the pond can be restored. You can browse through the Categories and Tags on the right for more history, and you can search our more than 200 articles. We have more information, including photographs and stories, in our Park History album on facebook. There is also information in the historical annotations on our trail map, and our new History Timeline lists our articles chronologically!